This Blakeney Summerhouse has recently been installed in our customer’s lovely garden in Stratford Upon Avon, Warwickshire. 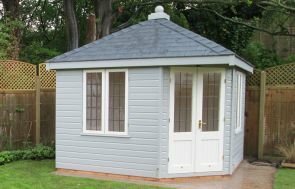 The chalet style of the Blakeney looks really nice in the customer’s garden, and it slots comfortably into the corner, which will give the customer a lovely view of their garden when they use it. Perfect for using as an outside entertainment area, a dining area, or just a general relaxation area for the customers to enjoy their garden in, this summerhouse is 3.0 x 2.4m in size with a roof overhang at the front, double doors and four sets of windows, painted in Verdigris Valtti paint. The roof has been protected with heavy duty felt, which is a durable material that gets torched onto the roof onsite. By torching the felt onto the roof, we ensure that the felt is waterproof, as it is also a non-rip material, giving the roof brilliant protection. The overhang on the roof is 400mm in depth, which, as well as enhancing the chalet style, will help protect the front of the summerhouse from rain or any other form of harsh weather. There are two opening windows on the summerhouse, one on either side, which will help with air flow, especially when the double doors are open as well. The cladding is shiplap, which gives the building a smooth finish, and Valtti Verdigris has been used to paint it. Verdigris is a pale green colour that works well in grassy, flowery gardens, and Valtti paint itself is an opaque, rubberised paint that completely covers the grain of the wood, leaving a solid colour in an array of natural shades, and it flexes with the wood so that no matter how much it expands and contracts (this is likely to happen in very hot or very wet conditions), the paint won’t crack. Inside the summerhouse, the customer opted for a Light Oak lacquer to help protect the floor from scuffs and blemishes, and it also gives the floor a nice sheen. The customer also wanted floor insulation. 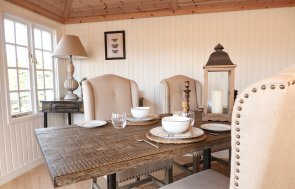 This Blakeney is a perfect garden building to enjoy summer days and evenings in, as it essentially adding an extra room to your property. 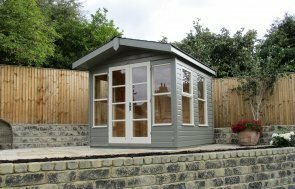 If you would like a summerhouse, or even a studio or Garden Room to enjoy your garden from, please have a look at our ranges and view the different levels that are available to you. If you have any questions about your requirements at all, please contact us online to receive a call back or call us directly on 017690 444229 and one of our helpful team will be able to answer your queries and go over your requirements with you.